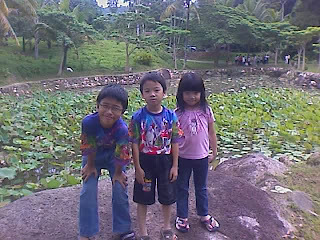 On the first day of 2010, the family went on a trip to Bentong. We were invited by my sister-in-law, who came down from Ipoh, to have breakfast in Bentong and then pay a visit to a nearby Buddhist Nature Farm (together with all her Buddhist friends). My sister-in-law is a staunch practitioner of the Buddhist philosophy. She started her journey into Buddhism about 5 years ago when she became a full fledged vegetarian. 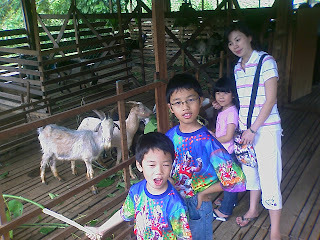 We reached the farm at about 1pm in the afternoon. The weather was just nice with enough cloud covers to make it a cooling afternoon. 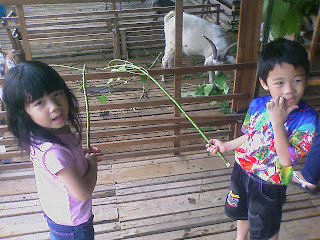 I took the kids for a walk around the farm. The farm is actually a sanctuary for all living things. The people who ran the farm accepts all kind of animals from anyone who wants to donate them. The water lily lake in the farm has lots of fishes, mostly donated by the public. You can see my kids were not enthusiastic about getting their photo taken. Things started to get exciting for them when I took them to feed the cows. They were scared at first... but after a while... no fear... LOL. 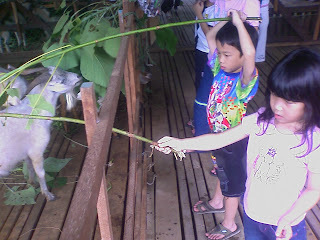 Then we went to the goat stalls and the kids just loved feeding the hungry goats. Jodene and Jordan reluctantly looked at me, when I told them I want to take a photo of them. A family photo with the goats. 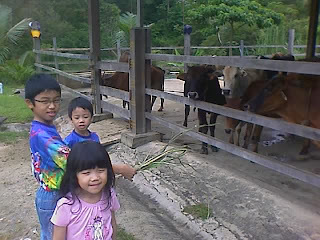 After the "animal farm", we followed the entourage to Bentong's Hot Spring. By then it was 2 plus in the afternoon. To my surprise, the Hot Spring was right next to the highway. 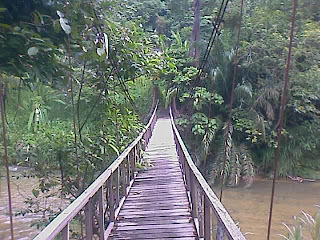 A suspension bridge leading to the Karak Highway across the river. Only if you think you are as versatile as the infamous Indiana Jones, would I advise you to cross over. The planks were loose and some parts rotten. Just opposite the suspension bridge was the Bentong Hot Spring, in it's full glory! Sad! When we reached the Hot Spring, I wanted to leave immediately... It was very sad to see that the place was in deplorable condition. Irresponsible visitors just piled up rubbishes next to the picnic hut area. The picnic huts were dirty and the wooden floor rotting. To make matters worse, the state government did not see the sense of maintaining this natural wonder. The guard house were run-down and all signs were hard to read. 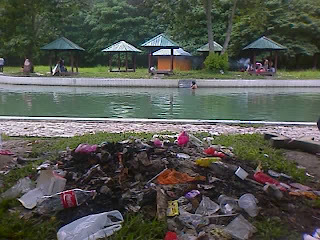 Compared to the nearby waterfall at Hutan Lipur Lentang, this place is a shame! I am no environmentalist or a tree-hugger, but I just think this is plain negligence on the State government part. Early this morning, I woke up to some screaming and laughter coming from the back of the house. I was wondering what the kids were up to. They had somehow found the 6' pool from the store and managed to filled it with water at the backyard. The kids with a "what's daddy going to do" look. And then the "it wasn't me" look. In the end, they just went about their business of enjoying themselves... LOL.